Handsome pewter pendant that is 5/8" in diameter on an 18" cord. A wonderful gift! 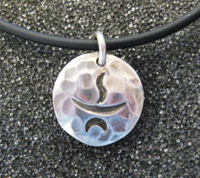 This necklace has a pendant that is 5/8" in diameter, is slightly domed, and has a hammered finish. It is on an 18" black rubber cord with a sterling silver clasp.